The wide canyons of Hasankeyf or the lush hillsides of İkizdere couldn’t seem further removed from the crowded streets of central Istanbul, but they are linked by common issues. “The resistance movement in Anatolia is not just about dams; it’s about the commodification of water, which is also happening in Istanbul, in Ankara, in İzmir,” says Umut Kocagöz, picking up a plastic bottle of water from the café table to demonstrate his point. The young filmmaker and three student colleagues, Özlem Işıl, Volkan Işıl, and Ezgi Akyol, are co-directors of “Akıntıya Karşı” (Against the Current), a documentary about the growing anti-dam movement in Turkey’s Black Sea region that recently screened at the !f Istanbul Independent Film Festival. 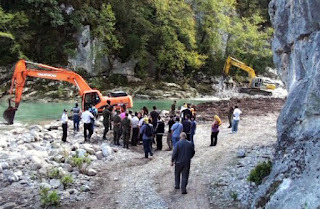 In an interview, Kocagöz and Özlem Işıl drew links between the dams endangering people’s homes and livelihoods in Black Sea villages and the “urban transformation” projects in Istanbul that are creating controversy over their effects on the Tarlabaşı neighborhood and nearby Taksim Square and Gezi Park. Like urban public space, rivers are a commons, the filmmakers said, noting that the cultural, historical, and economic significance of these waterways is bringing people together in a way not seen in years. “Akıntıya Karşı” screens at !f Ankara (AFM CEPA) on 2 March at 1 p.m. and !f İzmir (Cinebonus Kipa Extra Balçova) on 4 March at 1 p.m.